There was a time when getting hands upon the pdf versions of latest books was dead easy, which, needless to say, helped a great deal to students who with their meagre amount of pocket money barely could afford an expensive read. So the free pirated copies of books served a great measure to those hapless students. I know piracy is unethical but let’s not get on to all that serious stuff. But those days are behind us now. With the strict vigil set upon the cyber world by cyber crime police, it has become an impossibility to download any book for free. Anyway, as long as books are allowed to be borrowed and shared among peers, I have nothing to complain about since I finished off n' number of popular books by borrowing only from a constant source, a coaching class buddy whose passion was to collect books of her favourite authors; her taste coincidentally matching mine, I never had to think of buying the same book that she had in her trove. I really admire the way she used to lend books. There was a diary my friend used to maintain for writing the dates and names of the people she had lent her books to so that she could always keep track on them. I finished the entire Harry Potter saga to her credit only. But unfortunately, in the course of some uncalled for events of silliest nature, I lost touch with her. Infact, due to my callousness, I ended up losing her contact number. Though I have been searching my friend for last five years in the cyber world but her name, frequently used for naming girls in India, a fact I can affirm with certainty that at least one in every ten households has one inmate with her name, spews search results of thousands of her namesakes on Facebook alone and after all these years of not being in touch, not knowing anything about her whereabouts, whether or not after marriage she has retained her maiden name or changed it to her husband's, it is an uphill task to locate her amid the crowd. Though I took the utmost effort to make a comprehensive search by handpicking a few of her namesakes on the basis of the teeny weeny profile snaps displayed on the search results and visited their profiles, even enquiring to some if they are the friend I am looking for, considering that my friend might have put on or reduced weight or changed into a persona beyond my recognition after all these years in between, but all my endeavors at finding her went down the drain. She was never a very net savvy person, but in an age of social networking when my most net averse friends, batch mates and classmates are all over the place making their mark in the internet world, I can only wonder what hinders my friend from stepping into the virtual realm. About the recipe, Puti Macher Chochchori is a versatile recipe with respect to the fact that you may add any of your favourite vegetables into the curry. 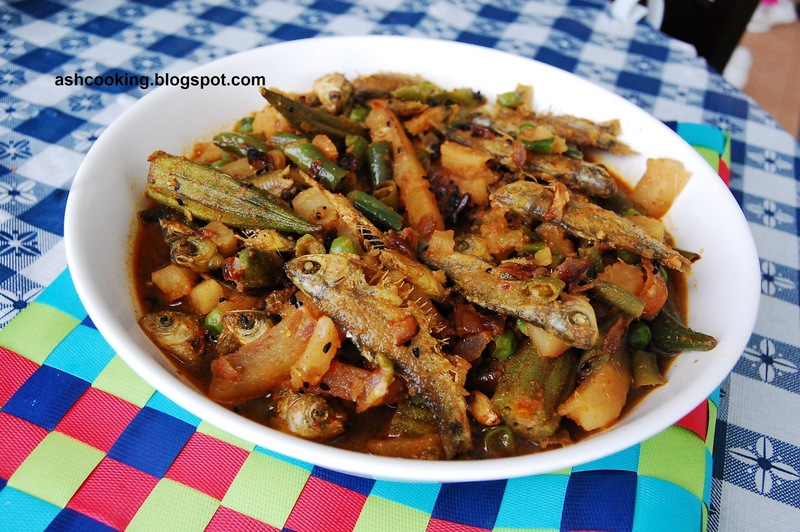 The original recipe had potol or parwal or pointed gourd used among others but due to the unavailability of potols of good quality, I relied on okra. So according to your preference, you may switch around. 1) Heat oil in a wok and fry the fishes. Keep them aside once fried. 2) Into the same oil, add the ingredients for sauté and wait till they crackle. 3) Add onion and fry till translucent. Add garlic and julienned potatoes. Shallow fry. 4) Add okra and shallow fry stirring occasionally. 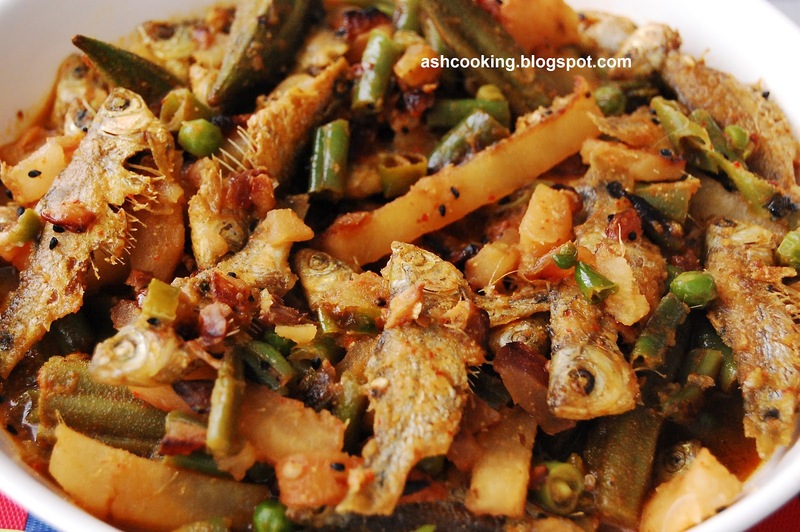 5) Add green beans, green peas and green chillies. Shallow fry stirring sporadically. 6) Add ginger paste, turmeric powder, cumin powder, kasmiri red mirch and coriander powder. Pour water measured about 1 or 2 cups, depending on your liking for the consistency of the gravy. 7) Bring the gravy to a boil. 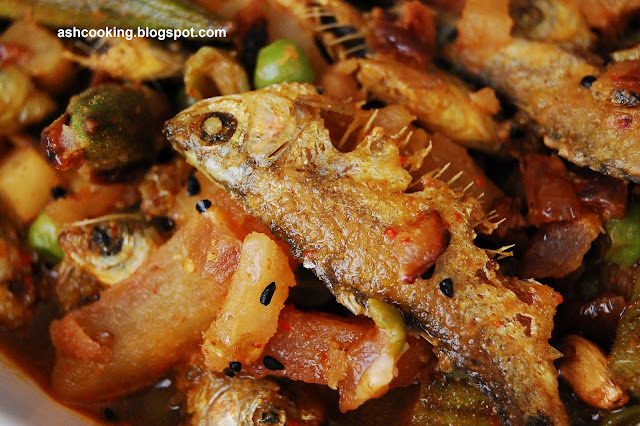 Add salt and fried fishes. Gently stir to mix in. Cook covered for 1 minute before turning the heat off.